Pineberry Lane has two new designs... one is Christmassy, and one isn't as much... but both are big on charm!!! 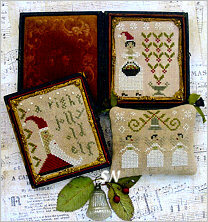 Merry Little Stitches is a trio of ornament designs which measure just 2-1/2 x 3 on 35ct. Santa, three angels and a Mrs Christmas... it's charted for regular ol' DMC! 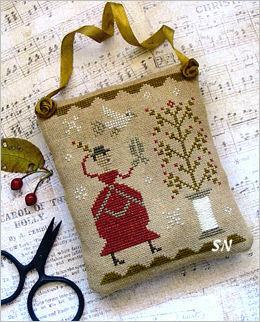 A Sprig of Holly features a seamstress with her scissors and spool of thread. 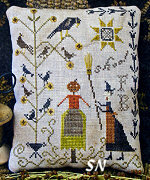 Finishing 3-1/4 x 4, she's stitched with regular DMC, just like Merry Stitches. She'd be cute finished as a little needle case or pin cushion. 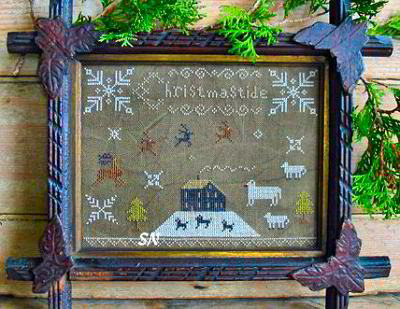 Pineberry Lane has a new chart that finishes approx 4 x 5-1/2 in size on 36ct. Coded for regular 'ol DMC floss (and nothing else!) we especially like the chicken, basket of eggs, the greenery and pair of chick around the basket. Not so crazy about 'Sister' - she's pulled out all her hair taking care of her chickens! 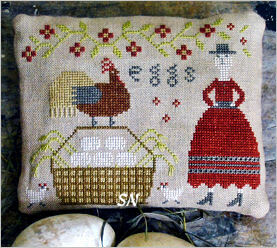 Stitch the whole thing, or leave Sister off... that basket, hen and chicks is pretty neat all by itself! 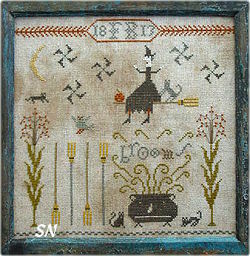 What a fun name for a witch... and kind of a fun piece to stitch! Ms Blackett is flying around with side-kick kitty on her broom... is she *brewing* her brooms... or cooking up new ones??? 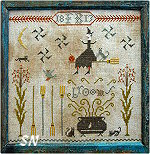 A whimsical scenario, this is stitched on Week's 30ct Beige Linen in 10 different shades of regular DMC floss. Approx 9 x 9, it is offered as a chart, and includes the distressing instructions to make your piece look like IT has been *brewed* by Ms Blackett! 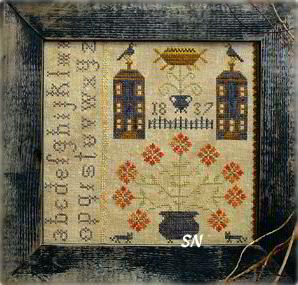 Finishing approx 8 x 8 on 30ct, stitch this in either DMC or Sampler Threads. I LOVE that panel of the alphabet on the left -- going another direction. 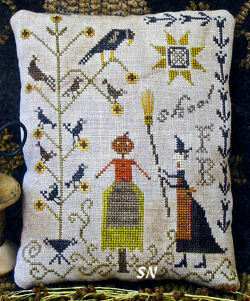 It's very different, and the way the stitching is done, you could even do it on a separate piece of linen and join them in this piece! The houses and the urn -- very classic and HERE! 6-1/2 x 8-1/2 of primitive Christmas personality, you see just about three colors in this piece when there are actually a combination of 7 in either Sampler Threads or DMCs. I love the contrast of the dark fabric against the lighter flosses, and the *coverlet* feel. Distress this before or after stitching! Offered as a chart.